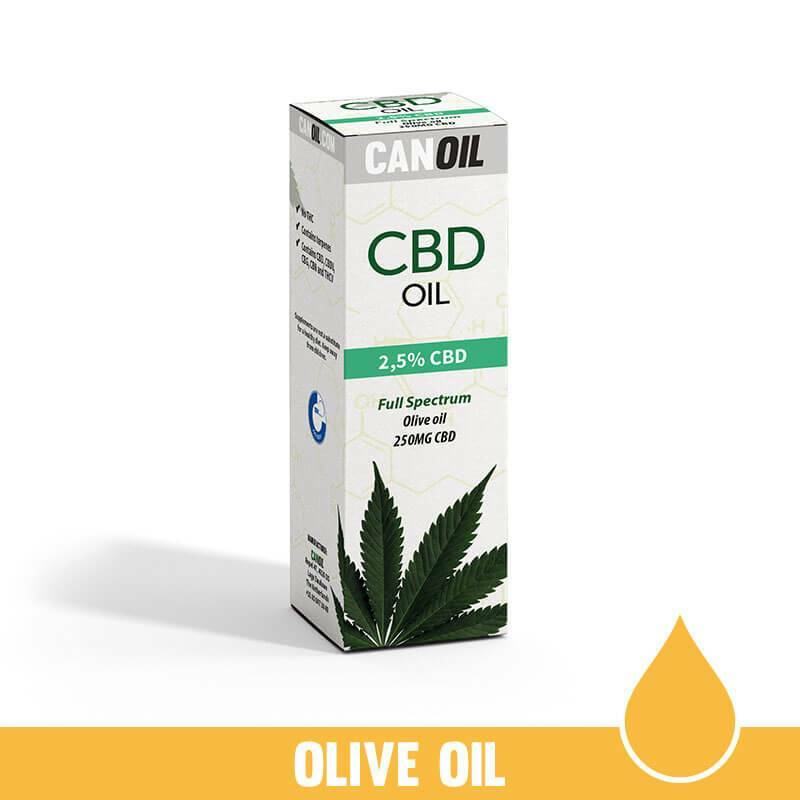 Canoil is a Dutch manufacturer specializing in CBD products such as this CBD Oil 2.5% (250MG / 10ML) Full Spectrum with Olive Oil. This 2.5% CBD Oil from Canoil is very popular because the CBD Oil contains the full spectrum. CBD stands for cannabidiol and is one of the no less than 304 cannabinoids that occur naturally in the hemp plant or cannabis sativa. Every human being and animal has a so-called endo-cannabinoid system. Endo means body's own. The endocannabinoid system regulates the functioning of the cells in the body. The cannabis plant contains the so-called phyto cannabinoids. Phyto means plant. These phyto-cannabinoids are like copies of our own endocannabinoids. This allows phytocannabinoids to influence or support certain processes or functions in our body without negative consequences of physical defenses. This is because the body recognizes it as its own. Cannabidiol is a phytocannabinoid that is seen as the body's own substance. This means that these substances can easily be absorbed quickly and correctly by our body. Difference CBD with Hemp Seed Oil and CBD with Olive Oil. CBD is often mixed with hemp seed oil, coconut oil, olive oil or sunflower oil, making the CBD extraction into CBD Oil. Is one better than the other? No, in essence they work in the same way as carrying oil containing CBD, terpenes and flavonoids. Hemp seed oil has certain qualities that are absolutely appreciated by many people. The CBD Hemp seed oil provides an authentic experience. This is because only the cannabis plant is used for the entire CBD Oil production process. The taste is distinctive and as a food supplement this oil brings with it some interesting advantages. Do you like the natural scent and taste of a flowering cannabis plant? Then we advise you to choose CBD Oil with Hemp Seed Oil. For people who have the taste of CBD i.c.m. With Hemp Seed Oil does not like the CBD with Olive Oil is definitely recommended. The taste of CBD with hemp seed oil is often described as bitter. The CBD with Olive Oil tastes like Olives and is for many people a solution that previously used CBD Oil with hemp seed oil and had problems with the taste of hemp seed Oil. What is Full Spectrum CBD Oil 2.5%? And what are the benefits? Full Spectrum means that other cannabinoids such as CBDV, CBG, CBN, and THCV remain during the supercritical CO2 extraction of CBD from the hemp buds. Depending on the condition and what you want to achieve, Full Spectrum CBD Oil can have a greater effect than CBD alone, because all cannabinoids work together in the so-called entourage effect. This synergy not only ensures a more effective product, but also ensures that any undesirable effects are prevented or reduced. Why choose Canoil CBD Oil? Canoil is the only CBD producer in the Netherlands that makes CBD Oil with 0% THC in contrast to many other brands that also offer CBD Oil that always contain a small percentage of THC. Canoil CBD Oil is only made from the best Hemp buds and not from the stems and / or branches of the hemp plant, which is of great quality.